These data come from the National Climatic Data Center (NCDC). Using the above link will download all of the data collected by the NCDC on the day of Hurricane Sandy. The data can also be obtained directly from the source at http://cdo.ncdc.noaa.gov/qclcd/QCLCD. The purpose of this post is not a discussion on kriging or any of its properties. The purpose is to simply provide a simple R example on kriging and how it can be applied on real data. 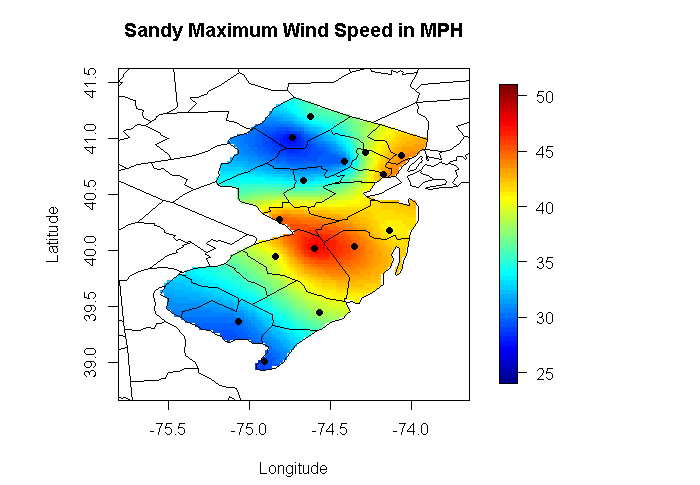 This R code uses Hurricane Sandy as an example and predicts the wind speed across the state of New Jersey using the measurement stations that the NCDC uses. It is easy to see how this technique can be applied to other data. wd <- "C:\\nj hurricane data"
# Which data points are outside the allowed range?